Former Prime Minister blasts PM Netanyahu over report he rejected peace initiative of John Kerry. 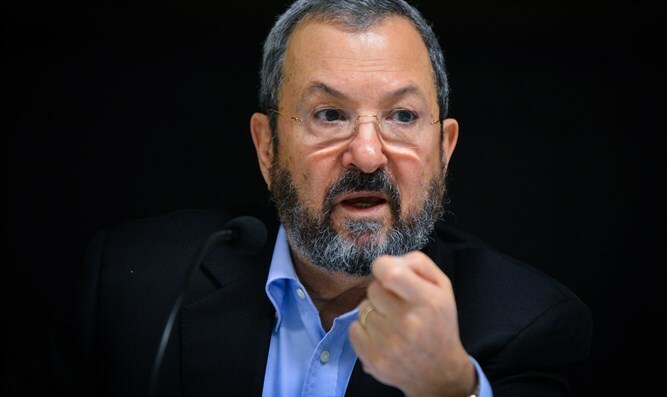 Former Prime Minister and Defense Minister Ehud Barak slammed Prime Minister Binyamin Netanyahu Sunday night for allegedly refusing to accept a peace initiative of former US Secretary of State John Kerry. In 2000, Barak himself participated, as then Prime Minister, in the failed Camp David summit with Yasser Arafat. Although Barak offered numerous concessions of his own volition, Arafat refused to sign an agreement, and the 2001 talks in Taba discussing what were called "The Clinton Parameters" fared no better, with the intifada bringing them to a summary end. Israel refused to give up the Temple Mount or allow in refugees under Barak, but offered almost 97% of Judea and Samaria, an offer that was rejected. The Palestinian Arabs refused to accept the "settlement blocs" existence. "The fiasco is exposed," Barak wrote on his Facebook page. "For two years now there has been on the table a proposal for a regional conference under American auspices. Why it did not work out? What is frightening about a regional conference? What is frightening in the strengthening of Israel's position in the region and in the forming of new and important alliances? What is so frightening about John Kerry? Everything is frightening to Netanyahu." Barak wrote that Netanyahu is weak and only concerned with his political survival. "Any fraction of a change that could undermine the foundations of the [Prime Minister's residence] paralyzes him with fear. The Zionist story is the story of courage and security against the odds, and one of triumph. Even if not every step was successful." Barak directly addressed Netanyahu. "Bibi, this is not how leadership leads. This crying and passivity like a victim pulls us down. This is a betrayal of the public trust and what is required of a Prime Minister in Israel. Israel must retake the initiative and take its destiny into its own hands. Only when we act we can ensure true security above all else; a Jewish, democratic, and Zionist State. 'Unity of the people' before 'Unity of the land.'" Haaretz claimed on Saturday that Prime Minister Binyamin Netanyahu took part in a secret summit in the Jordanian city of Aqaba a year ago, where Kerry presented a plan for a regional peace initiative. According to the report, Kerry’s plan included recognition of Israel as a Jewish state and a renewal of talks with the Palestinian Authority (PA) with the support of the Arab countries. However, it also included a contiguous Palestinian State - anathema to Israel as it would have to cross the country - and joint rule of Jerusalem, among other unacceptable positions. Jordan’s King Abdullah II and Egyptian President Abdel Fattah Al-Sisi were present at the meeting as well, the newspaper claimed, citing former senior officials in the Obama administration who asked to remain anonymous. Netanyahu reportedly did not accept Kerry’s proposal and said he would have difficulty getting it approved by his coalition. Nevertheless, according to Haaretz, the Aqaba summit was the basis for talks that began two weeks later between Netanyahu and opposition leader Yitzhak Herzog (Zionist Union) on establishing a unity government, but that ultimately failed. Herzog, who is left of center, may not have agreed to oppose the parts of the plan Netanyahu would not accept.